Description: Princesses are up to some fun! 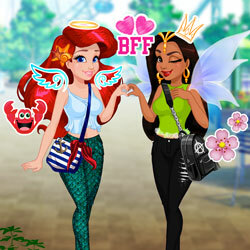 Join then in this social media adventure and have fun dressing up the girls in modern cosplay. Discover all the amazing styles like mermaid, fairy or rebel princess. After that go out to the park to take pictures and make sure you use the beautiful stickers and filters to get more and more likes on your social media.